Lilac-pink (H11) flowers, III–V; purple-green foliage in winter, turning glaucous green in summer; height 46–60cm; spread 46–60cm. Not reliably hardy; killed during the winter 2010–2011. Lilac-pink (H11) flowers, III–V; purple-green foliage; height 46–60cm; spread 61–75cm. Similar to 'Brightness' but less shapely. Shell-pink (H16) flowers, III–V; lime-green foliage in summer, turning yellow in winter; height 46–60cm; spread 61–75cm. When grown in soils that have high levels of magnesium soils, this stays lime-green and becomes vigorous attaining twice the height quoted. 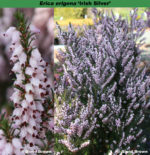 Seedling from Erica erigena 'Superba'; raised by A. W. Jones (Otters' Court, West Camel, Somerset, England) in 1973; introduced by Otters' Court Heathers in 1977. Named after the eldest son of Diane and Bert Jones. Deep lilac (H4) flowers, II–V; dark grey-green foliage; neat dome-like habit; height 31–45cm; spread 46–60cm. Shell-pink (H16) flowers, III–V; dark green foliage; forms a large dome in time; height 31–45cm; spread 46–60cm. A good garden-worthy plant. Named from Latin hibernicus = Irish. Salmon (H15) buds opening rose-pink (H7) flowers, XI–V; dark grey-green foliage; neat compact habit; height 46–60cm; spread 31–45cm. Found by David McClintock on the shore of Lough Carrowmore, County Mayo, Ireland. Name alludes to the dusky foliage and its origin in Ireland. Salmon (H15) buds opening rose-pink (H7) flowers, XII–V; mid-grey-green foliage; open habit; height 46–60cm; spread 31–45cm. Not as hardy as 'Irish Dusk', with which it has been confused; found at the same place and time as 'Irish Dusk'. Wild-collected; found on the north-western shore of Lough Carrowmore, County Mayo, Ireland, by David McClintock (Platt, Kent, England) on 7 April 1966; named by D. McClintock in 1970; introduced by John Letts (Foxhollow, Windlesham, Surrey) in 1970. Pale lilac (H4/H16) flowers, IV–VI, in short spikes; dark green foliage; compact; height 31–45cm; spread 31–45cm. Found by Valerie Proudley on the shore of Lough Furnace, County Mayo, Ireland. Small (4mm long x 3mm diameter at widest ), urn-shaped flowers, with dark anthers visible at the mouth; corolla translucent at base shading to pink at lobes; II–V; foliage dark green; habit broad compact; height 50cm; spread 50cm. This compact shrub with densely clustered small flowers is tolerant of alkaline soil and so is ideal for gardens that do not have acid soil. It will tolerate gravelly or rocky sites. 'Ivory' blooms in late winter and early spring and is frost-hardy. The individual flowers have pink lobes and notably dark anthers. This cultivar was first reported in 1978 as having been introduced by R. E. Hardwick, The Nurseries, Newick, Lewes, Sussex, but its origins are unknown. Plants grown under this name in England have malformed stamens and style but this does not affect the overall appearance. Heliotrope (H12) flowers, III–V, abundant; dark green foliage; erect habit; height more than 1m; spread 75–100cm. Lavender flowers, II–V; dark green foliage; upright habit; height 46–60cm; spread 46–60cm. Shell-pink (H16) flowers, III–V; grey-green foliage; neat small bush; height 16–20cm; spread 26–30cm. Lilac (H4) flowers, I–V; mid-green foliage; open erect habit; height 1.5m; spread to 1m. This plant blooms for five months. The name is derived from Pol (Gaelic for Paul) and Orla who named the plant for Paul Evans on his 50th birthday. Heliotrope (H12) flowers, III–V; glaucous green in summer, turning bronze-green in winter; height 46–60cm; spread 46–60cm. Heliotrope (H12) flowers, III–V, abundant; dull dark green foliage; upright, fairly dense in habit; height 46–60cm; spread 21–25cm. Found at Wilson's Nursery (Christchurch, New Zealand) about 1935, and at least in the mid-1960s believed to be a hybrid (E. x darleyensis - described by Young (1965) as 'a hybrid of mediterranea'). Lavender (H3) flowers, IV; dark green foliage; height 31–45cm; spread 46–60cm. Subject to frost damage in much the same way as 'Brightness'. Named from Latin ruber = red. Shell-pink (H16) flowers, IV–VI, getting dark with age, scented; dark green foliage; height to over 1m; spread 46–60cm. Introduced by Wallace in 1914. Named from Latin superbus = excellent. Pink flowers (H8), II–V; golden foliage throughout the year; height 75–100cm; spread 75–100cm. A seedling from 'Golden Lady', deliberately raised by Barry Sellers in 1984. This can withstand cold winds better that 'Golden Lady'. Registered 5 December 1996: B. M. Sellers, 8 Croft Road, Norbury, London SW163NF, England. Named after a friend of Barry Sellers and pronounced "ting nee".